I am so thankful everyday for so many things. When you have babies you want all kinds of things for them. You immediately feel the responsibility and want to raise good people and productive members of society. I am not a perfect person or parent and everyone makes mistakes. My kids have always known the one thing I will not tolerate is one of them ever being mean to someone for no reason. Fortunately, my kids are caring and considerate people and it has never been an issue. Don't get me wrong, I also taught them to speak up for themselves and not let anyone run over them. I stay in my own little world and don't go out of my way to be disrespectful or hurtful to anyone, but if someone messes with my kids or family, I tend to go after them. I know I am supposed to turn the other cheek and that is something I work on, but I only react to someone hurting someone I love. I really believe in the end we will be mostly judged on how we treated others. I have never understood being mean to another human being for no reason. I don't know why it's so hard to just be good to one another. It's the devil hard at work and we don't need to fall for that. I know from my relationship with my parents you never stop being a parent. In many ways, I need my parents more now than ever. I couldn't have raised my kids without them. A lot of things are considered successful parenting. For me, all three of my kids cook and wash their own clothes. They are all really good cooks and try new things. 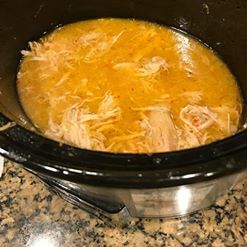 My youngest is really good at the crockpot and grill. Between the two, he has cooked more dinners this summer than I have! I am blessed and so grateful that I have not watched my kids go hungry. Not all parents can say that and I believe there is a special place in Heaven for those parents in that helpless and hurtful situation. I have sat and talked with many single parents at the courthouse trying to get child support from the other parent who is taking no responsibility. That is a hard and frustrating position to be in. I say single parent because although most were women, there are some men in the position of being the only parent responsible. This Thursday, I am thankful for kids who are now cooking for me. Stratton cooked dinner Tuesday night and grilled out last night. I should say I am also thankful they go to the grocery store. I don't like going to the grocery store and have so many hours of my life there I can't get back. This is Stratton's Italian chicken. Chicken with Italian dressing cooked in the crock pot, then he shreds it and eats in a bowl with rice and sauteed vegetables. It's even better the next day!